An exhibition at LACMA offers open dialogue about how the concept of home is understood and experienced. Home — So Different, So Appealing, curated by Chon Noriega (director of UCLA’s Chicano Studies Research Center and Adjunct Curator at LACMA), Mari Carmen Ramírez (Director of the International Center for the Arts of the Americas at the Museum of Fine Arts, Houston), and Pilar Tompkins Rivas (Director of the Vincent Prince Art Museum at East Los Angeles College), is the first of numerous shows in the region that will appear under the rubric Pacific Standard Time: LA/LA (Latin America/Los Angeles), funded, in part, by the Getty Foundation. For the curators, “home” is a broad concept that encompasses various notions, which they’ve organized into eight sections that cover a period of six decades and feature forty Latino and Latin American artists. 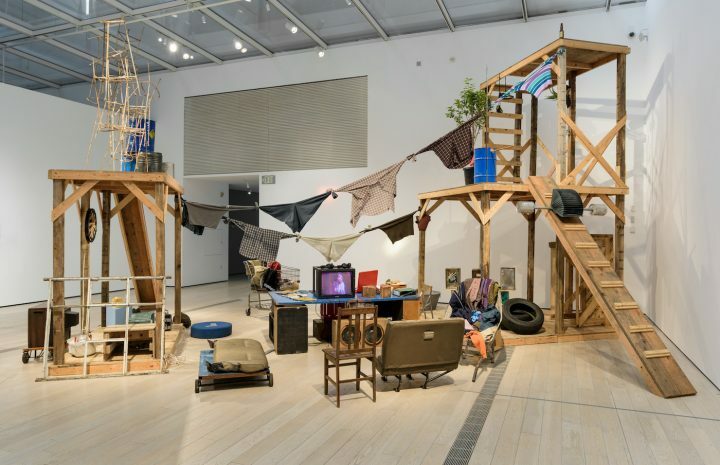 If these titled sections suggest an instrumentalized view of the word “home” for different artists in various Latino and Latin American communities, the curators see it more as an open dialogue, sometimes seeking out contradictory notions and chronological anomalies in the same sections. The viewer does not need to studiously connect the images, videos, and constructions in each section to their broader group descriptions to make sense of the show. In fact, I would suggest that first-time visitors simply wander through the numerous galleries and one hundred-plus artworks without reading the introductory wall texts, and then read the texts on a return visit — an art lover will want to return. The sections are useful for underscoring different aspects of home, from the socio-economic and geographic to the emotional and imaginative. Argentinian artist Guillermo Kuitca’s “Le Sacre” (1992), in which forty-five child-size mattresses are affixed to wooden frames with brass legs and painted with detailed maps of various locations around the world, is featured in the third section, “Mapping Home,” which uses maps and floor plans to combine geography with domestic interiors and furnishings. “Le Sacre” grew out of an earlier work of an apartment floor plan, but, despite the obvious use of the bed, it is unclear whether the maps painted upon them reflect Kuitca’s own sense of home, or simply project notions of travel and border. Are these places where Kuitca has lived or traveled, or just places he might wish (or wish not) to visit? 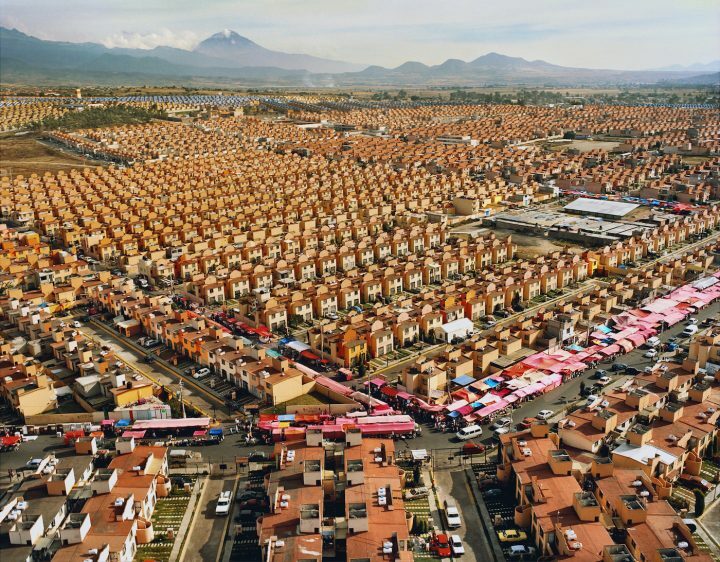 Mexican-born artist Livia Corona Benjamin’s awe-inspiring photographs 47,547 Houses (2000) and 10,000 300 Square Foot Homes (2009) representing public housing developments for former agricultural workers in Mexico, mostly constructed under Vicente Fox’s presidency, fit well into the first section, devoted to “Model Homes” and focused on the single-family home as a symbol of the economic, social, and psychological consequences of what the curators describe as the “utopian American Dream.” Yet in their utter and endless conformity, seemingly stretching for miles into the horizon, they might equally be at home in section two, “Archeology of the Home,” concerning art that transforms and deconstructs domestic objects and spaces into sculptures and paintings; the repetition of generic homes in these intensely colored photos creates the illusion of artistic creation — it is difficult to imagine this massive construction of low-income homes as being real, even if it exists in real space. “Excision” (2012), a slice of a cement-and-plaster wall and wood furniture by Columbian artist Leyla Cárdenas’ construction of cement, plaster, wire, and wood is included in “Archeology of the Home,” yet we might also ponder whether this isn’t a kind of “recycled home” (section four), exploring the tensions between debris and domesticity, or even an aspect of a “troubled homeland” (section seven) since the remnants of domesticity are in this case so distorted, as if presenting an after image of threatened domesticity. This is not to challenge the curators’ categorizations, but simply to recognize how flexible such categories can be, and how almost all the works in this show question as much as represent the sections. One of the most impressive of constructions in this show is Mexican artist Abraham Cruzvillegas’ immense “Autoconstrcción” (2010). Cruzvillegas has created a sprawling, jungle gym-like construction that evokes the patterns of the urban poor in creating homes with materials they find. The “home” of this piece is based on the artist’s own childhood home in the squatter shantytown of Colonia Ajusco south of Mexico City, built upon a volcanic stone plateau that community planners deemed inhabitable. The raucous inventiveness of this installation — built from wood planks strewn with domestic items such as TVs and clothing — is amazing to see, and stands as testament to human invention. Perhaps the most profoundly complex notions of home can be witnessed in US artist Daniel Joseph Martinez’s highly ironic piece, “The House America Built” (2004/2017). 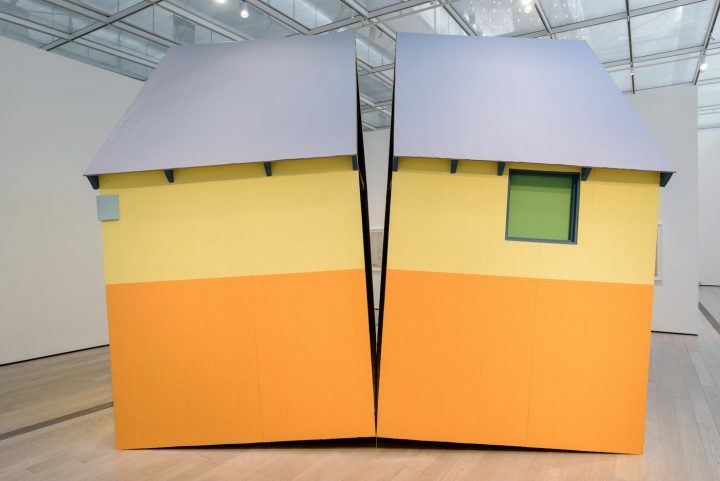 Martinez created a scale version of Unabomber Ted Kaczynski’s Montana wilderness cabin — which was modeled on Henry David Thoreau’s Walden Pond home — painting the exterior with Martha Stewart version of “living paint colors” (represented in this show by her 2017 palette). Kaczynski and Stewart, both second-generation Polish Americans, were concurrently imprisoned. Adding to these intersections, Martinez “split” the cabin in half to suggest the famed 1974 work by artist Gordon Matta-Clark, Splitting (also included in this exhibition). This work, clearly about home, violence, and the intentional and unintentional destruction of American domesticity, is so rich in its various arcs of continuity, that it is difficult, a first, simply to assimilate them. However, the visual form of the work clearly spells out its themes as the viewer moves around the stunningly beautiful construction. It asks if Stewart can make the home of someone like Kaczynski a lovely thing — or at least create a simulacrum of suburban order. These and other large works demand our attention in this fascinating show, but numerous smaller photographs, videos, and oils are also worth contemplating, as are the remaining sections, “Home as Form,” which isolates elements of domesticity without erasing their original functions, and “Embodied Home” which explores gender, the body, and its relationship to domesticity. 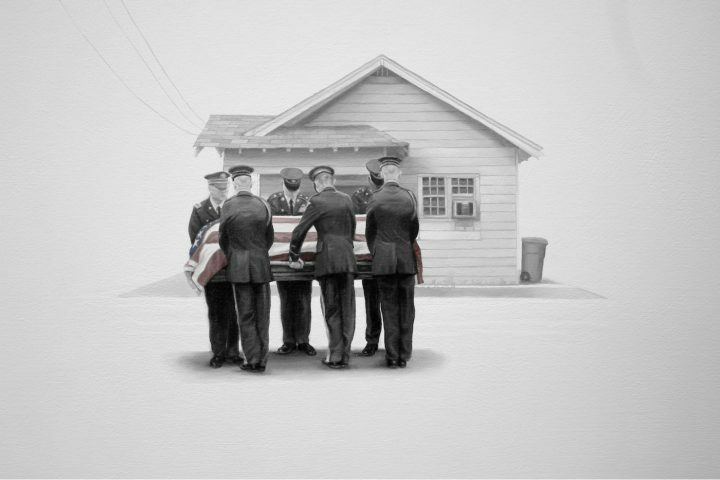 American artist Vincent Valdez’ 2012 paintings, “Excerpts for John #3” and “Excerpts for John #6,” of dead American soldiers being returned home (in the final section, “Going Home”) are particularly important. The focus on the coffin in the former and the small, almost doll-like house behind pallbearers in the latter demonstrate that for the subject and brave men like him, home has been diminished and completely lost. Their homes are now the flag-covered coffins in which their bodies are confined. Like Julio César Morales’ video Boy in a Suitcase (2015), the struggle for home and homeland often ends in confinement greater than the initial oppression, with possible death and suffocation as the rewards. Home — So Different, So Appealing continues at the Los Angeles County Museum of Art (5905 Wilshire Boulevard, Los Angeles, California) through October 15.